Mediasite is a classroom lecture capture technology that allows an instructor to easily video record their lecture(s) at selected locations on campus (Serra 155, LRC 132, Coronado 134 and BINR 106). In additon, Mediasite also makes it possible to record lectures or presentations directly from your local computer, using a version called Mediasite Desktop Recorder (MDR) which uses your computer's microphone and camera for content capture. Both the classroom and desktop version of Mediasite publish to an in-house streaming server which is USD login protected. The links to the streamed content can be viewed by students inside the learning management system (Blackboard), on a personal website via a private link, or viewed through the Mediasite App on their mobile devices. The user interface of the Mediasite player allows slides, video, and audio content to be presented in thumbnail segments allowing the user a number of various access points throughout the length of the recording for easy navigation. Why do I want Mediasite? Mediasite at USD is not intended to be used in place of face-to-face teaching, but rather in addition to it. 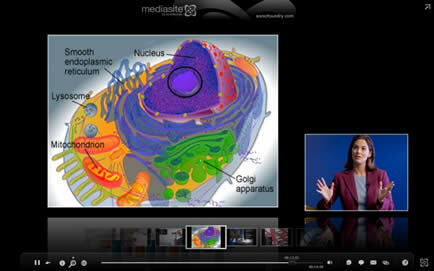 Mediasite makes it possible for students to revisit a lecture as many times as they like, which can be especially valuable for exam review or to gain a better understanding of a difficult concept. Mediasite is an effective way for instructors to build libraries of material that can be accessed not only by students, but also by colleagues, practitioners, and the extended academic community. Currently, Mediasite is installed in the following classrooms for the purpose of recording lectures. Additionally, USD has licenses for the Mediasite Desktop Recorder that can be provisioned to faculty members for the purpose of recording. How Do I get Mediasite? Lecture Capture: Currently we have four classrooms with Mediasite installed (listed above). You can work with your department's technical or scheduling liaison to reserve one of these spaces. Desktop Recorder: To request a license for the Mediasite Desktop Recorder, please complete the Mediasite Account Request Form. When submitting a request, please be sure to include your department and intended usage. The iTeam can provide training on Mediasite in a one-on-one or group format. Please contact the iTeam at iteam@sandiego.edu to arrange training.